Humans have altered landscapes from the beginnings of civilization, either through agricultural practices, deforestation, dam building, or through roads, mines, tunnels, settlements, and other practices that all result in the transformation of nature and the environment. With the imperial expansion of Europe into the New World and other continents, these transformations became global in scope. This, in turn, led to more trade, greater transportation systems, and enabled unprecedented population growth, industrial agriculture, rapid technological advancements, and the systematic extraction of resources. This human impact on nature intensified radically during the Industrial Revolution and, more recently, in the Great Acceleration of the 1950s that led to the proliferation of nuclear technology and globalized trade. 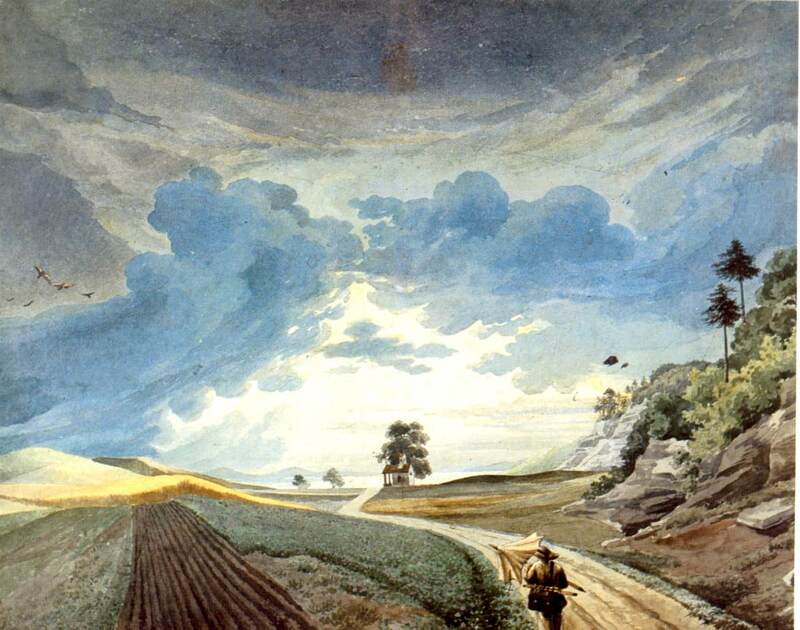 Gottfried Keller, Landschaft mit Gewitterstimmung [Landscape with approaching thunderstorm], 1842. Watercolor, 35 x 47 cm. Held by Zentralbibliothek Zürich. Accessed via Wikimedia on 4 September 2018. Click here to view source. These developments have caused scientists such as Paul Crutzen, Eugene Stoermer, Will Steffen, Jan Zalasiewicz, Reinhold Leinfelder, and others to call our age by a new name, the “Anthropocene”—a name for an era in which human beings have become a geological force capable of changing entire Earth systems. The scientists posit that these developments accelerated greatly after the end of World War II, a thesis that they visualize in scientific images such as the famous hockey-stick graph. The medium of literature takes up a position on these developments, and registers them both thematically and structurally within the text. It presents the environmental transformations in a positive, neutral, or negative light through the perspective of the fictional characters, poetic narrators, and dramatic figures that engage with them, either approvingly or critically. Through literature, readers can participate in these negotiations and share the fate of the fictional characters that are exposed to these transformations of landscapes or, in some cases, are actively engaged in advancing them. Literature has an impact on its readers through the points of view of the characters that act in it, and who influence the readers’ reception of the story. We think a long time about a story that has gripped us. Literary characters can become best friends or antagonists—when characters have certain experiences, they also have an effect on us as readers. Literary characters can inspire us to further reflection, and on occasion they can even turn us into activists and critics. Even though the Egyptians already built mines, the history of mining enters into a new phase around 1800, when new technologies based on new scientific knowledge were introduced. In Germany, the founding of the Mining Academy in Freiberg (Bergakademie Freiberg) in 1765 is evidence of the much more systematic study of mining and the techniques for extraction and processing of minerals. Several of the German Romantic poets developed their appreciation of the value of minerals there. The academy still operates today and is the oldest and most important educational institution in the world explicitly devoted to the study of mining. No wonder that mines played a major role in Romantic poetry. One of the Academy’s most famous graduates was Alexander von Humboldt, who became a mining engineer in Saxony before engaging on his world-famous trip through Latin America (1799–1804). During that trip he had many opportunities to observe conditions in the local mines and offer criticism in the many lectures he gave and works he published after his return. In Europe, it was the mines of Falun in Sweden that were on everyone’s mind at the time, and which became the setting in one of E. T. A. Hoffmann’s tales. Hoffmann develops an ambiguous perspective toward the mine in his story by portraying it through the enthusiastic eyes of an old miner: at the same time, he counsels caution through the perspective of the main character, who eventually loses his life in the mine. Goethe’s Faust, on the other hand, overcomes this Romantic ambiguity by focusing on modern technological solutions to environmental problems—an attitude, however, for which he is punished at the end of the play. The movement of literary realism in the second half of the nineteenth century is represented in this exhibit by passages from the Swiss-German writer and painter Gottfried Keller. In his last story, Keller focuses on another type of landscape transformation, in this case the phenomenon of building sprawling settlements and road systems that transform entire green subalpine meadows into ugly construction sites and open up the entire countryside to travelers through an extensive system of rail tracks, roads, and ever-expanding railway stations. Modern and contemporary authors highlight the precariousness of landscape transformations even more directly and critically. This can be illustrated, among many examples, by the texts of W. G. Sebald, the German writer turned literary critic and professor of European literature at the University of East Anglia in Norwich, who walks through England and parts of continental Europe encountering nothing but altered and destroyed nature (some by naturally occurring erosion, some by human activity). Sebald’s narrator suffers greatly and emotionally from these encounters. These literary texts register transformations of landscape on the level of the character and their perspectives on their experiences. Over the stretch of more than two hundred years, an attitude of Romantic enthusiasm about the sites of extraction gradually gives way to open criticism, often resulting in a melancholy attitude on the part of the characters who, wherever they turn, encounter nothing but sites of alteration and, ultimately, destruction. 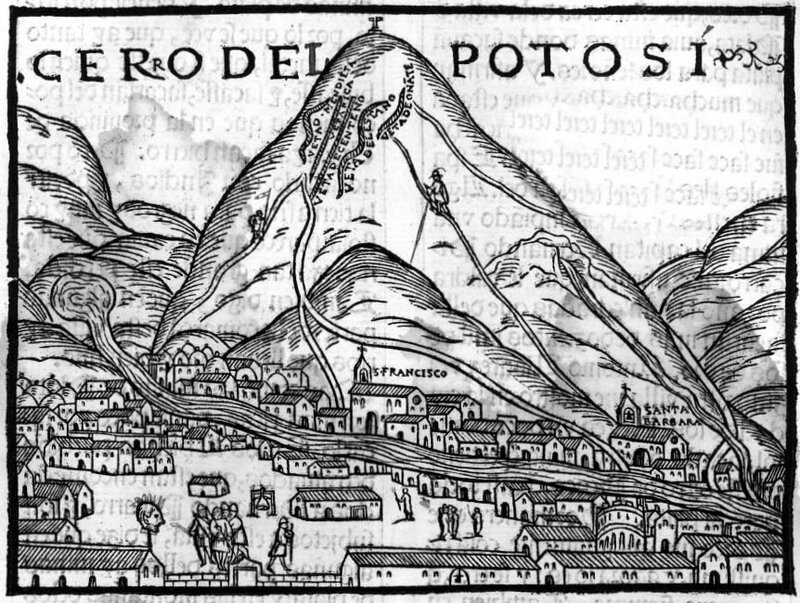 Sixteenth-century illustration of the Bolivian city Potosí, from Crónica del Perú. Pedro Cieza de León, 1553. One of the governors who recently arrived in these coastal areas had to praise the mines in order to live up to the court’s expectations. And in order to cover up the lowly and ugly character of the greed for gold at least to some extent he justified it with the use that they wanted to put these rich resources to that were collected through trickery and violence. —Alexander von Humboldt, Die Forschungsreise in den Tropen Amerikas (1815), ed. Hanno Beck (Darmstadt: Wissenschaftliche Buchgesellschaft, 2008), 2:436. Even Christopher Columbus’s letter to King Ferdinand, in which Columbus praises the value of gold as a resource that soon will be available for the Spanish king’s glory, gives grounds for criticism. Humboldt calls the letter a document that is rooted in its time, but comments that it pains him to hear “such a pompous praise of the riches from a person whose entire life revealed only the most noble selflessness” (p. 437). These passages show a growing critical awareness among progressively leaning European intellectuals at the beginning of the nineteenth century that the imperial era of European influence on the rest of the world was and continues to be based on the systematic and unsustainable extraction of natural resources from these new worlds for the benefit of growing European empires. 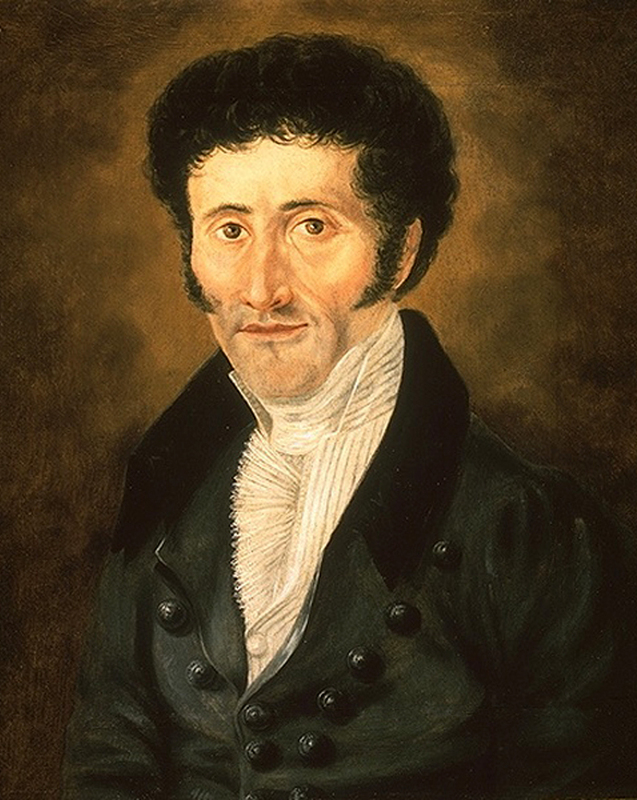 Nineteenth-century portrait of the German Romantic author E. T. A. Hoffmann. Artist and year unknown. Oil on wood, 41 x 35 cm. Held by Alte Nationalgalerie in Berlin. In a tale from 1819, the German Romantic author E. T. A. Hoffmann focuses on one of the largest mines in Europe in the Swedish town of Falun. In this story he emphasizes the tragedy of deadly mining accidents. The seaman Elis Fröböm, facing the mouth of the mine of Falun for the first time during his visit there, reacts with horror, an emotion that he has to overcome in the later part of the story if he wants to follow his heart and marry the beautiful Ulla, daughter of a mining baron. But shortly before their wedding, Elis is buried alive in the mine and Ulla, ironically, is only able to embrace the fully preserved corpse fifty year later when the body is found again. [H]e described the great main-shaft, with its dark brown sides; he told how incalculably rich the mine was in gems of the finest water. More and more vivid grew his words, more and more glowing his face. He went, in his description, through the different shafts as if they had been the alleys of some enchanted garden. 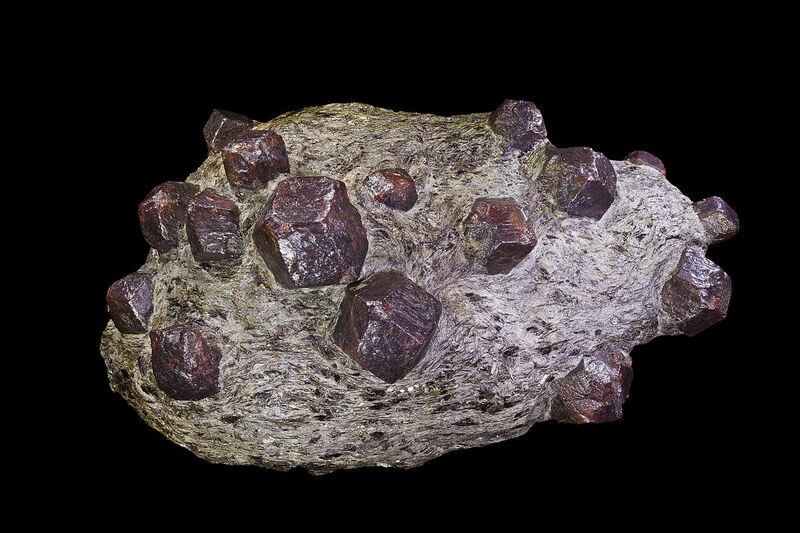 The jewels came to life, the fossils began to move; the wondrous pyrosmalite and the almandine flashed in the light of the miner’s candles; the rock crystals glittered, and darted their rays. —E. 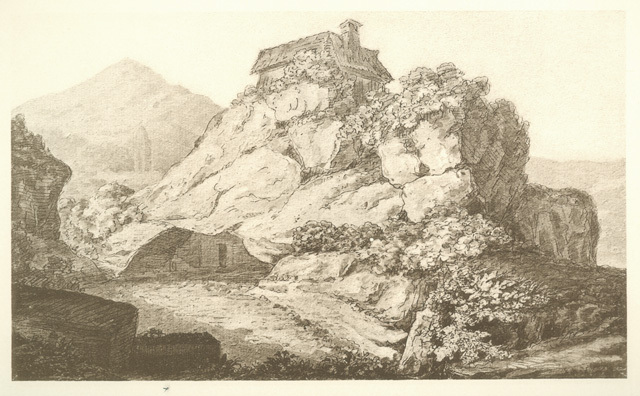 T. A. Hoffmann, “The Mines of Falun” (1819), in The Best Tales of Hoffmann, ed. E. F. Bleiler, trans. Major Alexander Ewing (New York: Dover, 1967), 290. Almandin on grayish-green slate, found in Austria. Object size: 19 x 11 x 7 cm. Photograph by Didier Descouens. —Hoffmann, “The Mines of Falun,” 293–4. By putting these two attitudes towards the practice of mining side by side in his story, Hoffmann encourages his readers to reflect on the extent of the transformation of landscape through mining and the use of minerals in everyday life. I don’t ask why they are, or where they’re from. Softening them to vales, gently bounded. —Johann Wolfgang von Goethe, Faust (1833), trans. A. S. Kline, in the online resource Poetry in Translation (2003), lines 10095–102. Drawing of the marble quarry near Hof. Johann Wolfgang von Goethe, 1810. Accessed via Goethezeitportal on 6 September 2018. Click here to view source. In Swiss-German realist author Gottfried Keller’s last novel, Martin Salander (1886), the title figure hardly recognizes his hometown when he returns to Switzerland after spending several years in Brazil. 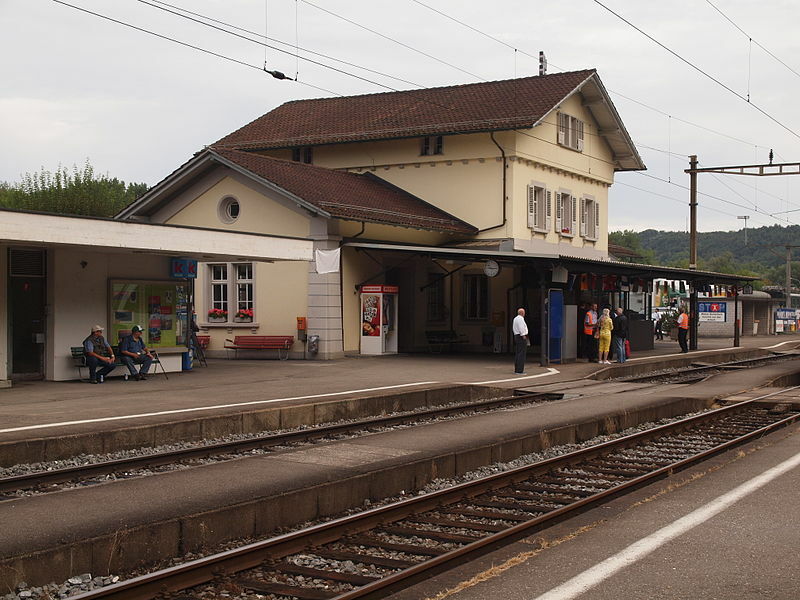 A small provincial railway station in Switzerland. Photograph by Bobo11. [Martin Salander] searched fruitlessly however among the never-ceasing additions to the town, looking for traces of the old shady friendly paths which earlier had led upward between gently rolling meadows and gardens. Now these same paths lay buried under dusty or gravel-surfaced roads. —Gottfried Keller, Martin Salander (1886), trans. Kenneth Halwas (London: John Calder, 1963), 5. 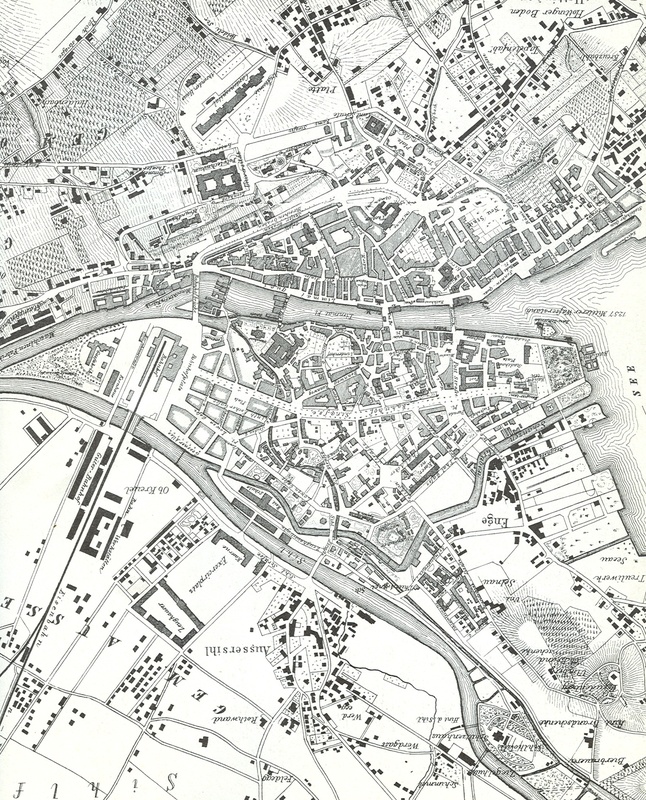 Nineteenth-century map of Zürich. Drawing by Heinrich Weiss-Keiser, c. 1865. The Dufour map of 1846–65 documents the transformations of landscapes as a result of modern settlements and transportation networks that were recorded for the vicinity of Zurich. This image of Zurich and surroundings shows the extent of human settlements in the middle of the nineteenth century. The densely built-up landscapes of today, with all their transportation networks, road- and trail-systems, create a topography that is characterized by pollution and waste from human activity: something that comes into full view in contemporary literature. W. G. Sebald, who lived and worked in England since 1966, described densely built-up landscapes in his novel The Rings of Saturn (1992), which was inspired by a region in the Netherlands that he was able to observe from above while flying back to England from his hiking trip through northern Europe. The small propeller plane that services the route from Amsterdam to Norwich first climbed towards the sun before turning west. Spread out beneath us lay one of the most densely-populated regions in Europe, with endless terraces, sprawling satellite towns, business parks and shining glass houses which looked like large quadrangular ice floes drifting across this corner of the continent where not a patch is left to its own devices. Over the centuries the land had been regulated, cultivated and built on until the whole region was transformed into a geometric pattern. —W. G. Sebald, The Rings of Saturn, trans. Michael Hulse (London: The Havill Press, 1998), 90. Sebald’s narrator hikes through a completely desolate piece of Earth altered by human activity, and experiences this transformation physically and mentally as a form of destruction. This leads to a state of melancholy. —Sebald, The Rings of Saturn, 172. Sebald’s character articulates this panic and feeling of melancholy by using a writing style that molds the reader’s perception of the reality of the scene. He makes very detailed and careful descriptions of the destroyed landscape that he is walking through, with the effect that it becomes almost irrelevant whether or not this destruction was caused naturally or through human activity.